In my time as an Air Conditioning Repair and heating professional i have answered many calls about a air conditioning or heating system not working and have repaired many over the phone. I will list 5 of the most common repair calls we get here in hopes it will help you. This is the number one call we get. With many thermostats being sold in stores now there are many people installing there own. If this is you and if you followed the wiring instructions and now are not getting any power to the thermostat you probably burned the 3 or 5 amp fuse in the furnace if you didn’t shut the power off to the furnace. First go to your furnace and look for a power switch near the furnace and shut off the power. Second open the panels and look for the circuit board. On the board itself you should see a fuse, pull it out to see if its burnt, if it is i recommend going to a auto parts store and buy a box of that size fuse which is normally a 3 or 5 amp (either will work fine). Put in the new one and you should be good to go. AC has been repaired! If you are seeing water dripping on the side of your house that means there is a problem. It usually means your main drain line is clogged and as a way to inform you of the issue per code the water is then directed outside over a window usually were it can be easily detected. The best way to correct this is to find the nearest bathroom to the indoor unit. under the sink you should look for either a pvc pipe coming from the wall or a tube. 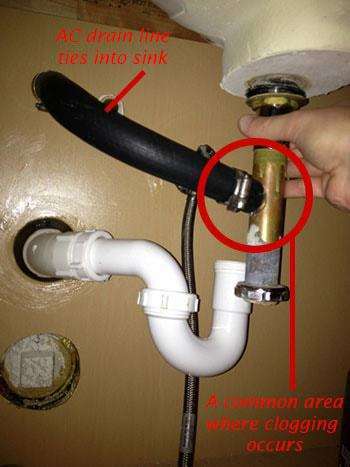 Most air conditioning drain lines pipe into the nearest bathroom sink. Get you a bucket and some old towels and remove the p trap and pipes under the sink. (There will be lots of water) take all the pieces outside and run water through them with the water hose till they are all cleared out. Put it all back together and make sure all is tight, turn the faucet on and watch for a few minutes to make sure you have no leaks. This happens more than you would think and actually goes together with #1 on this list. If you were weed eating around you condenser and accidentally hit a wire while the unit was running you probably burned the fuse. (iv’e done it once) First go to your furnace shut the power off and open the panels, Find the circuit board and the fuse on it you should be able to see a burn mark on it when you pull it out. 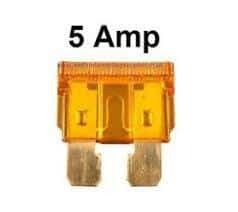 Replace it with another fuse 3 or 5 amp, but before turning the power back on go outside pull back the wire and make sure to reconnect any cut wires color for color, using wire nuts if possible. Once that is done turn the power back on and your good to go. (if you circuit board doesn’t have a fuse then you’ve probably burned the transformer and its time to call a professional Residential AC repair company. When it’s cold and your heater is not working here is a simple fix. If you notice your gas furnace fires up and you hear the flames shoot out just to hear it shut right off again then you might have a bad flame sensor. Good news is you may be able to get it to work with sand paper. Go to your furnace and turn the power switch off, remove the panels and over by the burners in the back you should see a little metal rod sometimes in a L shape and should have only one wire going to it. 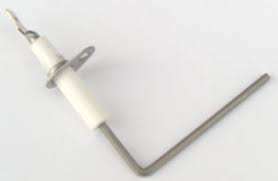 Pull it out usually has (1) 1/4″ screw holding it in, pull it out disconnect the wire and clean it off with the sand paper. Make it shine again and then put it all back together re start the heater and you should be ready to go. If this doesn’t work, well its time to call a professional Heater Repair company. This could really be many different things but i like to check the simple things first before jumping to something more serious.If your heater is running for only for a few minutes and the shutting off it’s probably shutting off on high limit meaning the interior of the furnace is getting too hot and shutting off. This could be caused by a dirty filter, even if you just replaced it but i had any work done in your home that caused a lot of dust it s most likely dirty. You can’t see it sometimes but once it’s out you can infidelity feel how heavy it is. Give that a try. How Much Does A Furnace Repair Cost in Rockwall Tx?